Many types of hypertension exhibit a renal component. To characterize the role of the kidney in the development of hypertension in more emphatic terms: There are few types of hypertension in which a primary or secondary renal involvement can be excluded with certainty, even in the early stage. Every type of hypertension can lead to renal damage in the form of benign or malignant nephrosclerosis, which in turn can aggravate the hypertension. In the case of essential hypertension, for which many authors reject a primary renal component (see Ref. 40,) though both epidemiologic10,47 and animal studies2,10,47 point to insufficient renal sodium excretion due to genetic and nutritional influences as the cause of the hypertension. 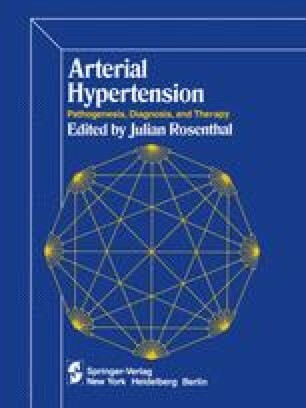 In this chapter, however, we shall deal mainly with types of hypertension that are caused exclusively by renal parenchymal changes and are not surgically correctable.